Easy DIY E-Liquid Calculator for mixing juice for your electronic cigarette. Just fill out the form to get your recipe. Get the perfect PG/VG mix, nicotine strength and flavour. Make sure to bookmark this easy DIY e-liquid calculator to keep it handy. 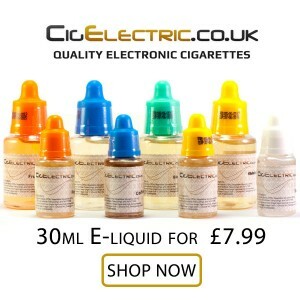 For high quality and low cost pre-made e-liquid we recommend CigElectric’s E-liquid. Set the base liquid of your nicotine and flavouring to either PG or VG to get an accurate PG/VG ratio recipe. Adjust the drops per ml to match your pipet size or bottle top. Useful for making small batches where measuring the exact ml might be difficult. If you get “PV/VG not poss” this is because your PG/VG ratio is not possible due to the dilution requirements or amounts of your base liquids. You either need to change the ratio or use a different base for your flavouring and nicotine. I hope you find this e-liquid calculator useful. Check out the rest of the blog for electronic cigarette reviews and more! I used the calculator for 30ml 50/50 6mg nic 10% TFA Grape and taste nothing, added more grape and even more grape up to 10 ml and still taste next to nothing. New coil still mostly vg taste. Any ideas. Sometimes less is more, You could try less flavouring or do a google search for the specific flavouring and see what % other people are using. If that fails maybe you need to try a different flavour! Hey, I bought 960 ml of 70/30 VG/PG at 3mg nicotine premix. I bought a 120 ml of diluted flavoring to add to this premix. I read that I should stay somewhere around 12-13% on this particular flavoring. If I add the 120 ml flavoring to the 960 ml premix VG/PG, it looks like I will be around 13% on flavoring. Does that calculation seem correct right? Hi I want to make a 10 ml bottle with a 6 mg strength I’m not using nicotine I will be using a 50/50 pg vg mix. How many drops of flavour should I add. drops per ml is only used if you don’t want to measure in ml’s, and you want to mix using drops only. Hey Benji i wanted to make 50ml bottle with 70/20 PG/VG with no nicotine how much flavour would i put into this? The flavour amount is completely up to your taste preference and specific flavouring used. Please help, so lost and trying to quit smokes. I have a variety of 10ml flavour bottles that are pg and vg, I’m assuming 50/50. and a large 100gm/100ml pure nicotine. I just want to mix up one bottle at a time to make it simpler. I want lots of flavour and a decent amount of nicotine to satisfy cravings. Am I right to calculate that I mix 2.5mls of nicotine to 7.5mls of flavour juice using a syringe. Then I’m ready to vape? Please help. Thankyou for your site, it’s the least confusing so far if I’m understanding it correctly.. Never been so lost in my life! Or is it 1/10 ratio because my nicotine is so strong? So sorry to be such a bother hey! Hi Tami. If you want strong nicotine go for around 20mg/ml. That means you put Nicotine Base Strength = 100 and Target Nicotine Level = 20. I would recomend starting your Flavour Percent at 10%. You will need some unflavoured PG or VG to add to the rest of the mix. Otherwise you will have no control on your flavouring percentage and it will be far to strong. I’ve been using your calculator for almost a year now and it’s helped me out a lot! !! Easy to use, all fields are self explanatory, I don’t know how it could be simpler. For those that struggle with mixing, I use vampire vape flavour concentrates and mix 65/35 VG/PG at 15% flavour and they come out a treat every time. Blackjack is the only flavour I’ve found that develops a lot over time and have found 8 weeks to be the point where it is at its best, all others I start using straight away. Make your own coils*** Damn auto correct!!! Hi Benji, I’ve seen CBD e-liquid bottles that say something like “250mg CBD” in a 10ml bottle. I want to make my own CBD e-liquid but I can’t work out how I go about working out the mg of the CBD per 10ml bottles. If I were to buy 250mg of CBD crystals and disolve them in a set amount of the VG or PG …lets say 10ml of PG …is there a way now that I can work out how many drops of that CBD/PG liquid to use in a 10ml bottle to acheive 250mg of CBD? If you can help me work this out I would really appreciate it. I can’t seem to get my head around it and it’s really annoying me. Many thanks for your time, Alex. Hey Alex, I don’t have any experience with CBD but if the bottles are saying they have “250mg CBD” per 10ml bottle (not 250mg/ml), then you just dilute your 250mg of crystals into your 10ml e-liquid and then you have it. I’m just getting started making my own vape Juices with a CBD component & your calc has been very useful & easy to use. Thanks for the help. Hi. If I use ag 80vg 20 distilled water on e liquid calculator,do I need to put dialutet section 20? Thanks for this – really helps with making up eliquid in different strengths and quantities. This might be a daft question, although I have been told there is no such thing. In the calculator it asks if your flavouring is VG or PG but any site I have been on only states the flavour and bottle size? Any help would be great as I am looking to start mixing my own too. Also is it best to have your nicotine in the PG or VG? You can so tell I am new to this. Hi Benji, i bought my husband the wrong liquid 1.8, he usually uses 1.2 oops what can he add to bring the strength down? Another noob, would I be right in thinking that if I require AG rather than VG. I would set PG to my desired 60% and the calculator would give me a VG-AG of 40%. Hi Darren, that is correct. Brilliant calculator, so easy to use. Get a 1ml and a 10 ml syringe and it’s child’s play! Saved so much money and saved disappointment from weak flavoured e liquid. getting on a bit, (old man) your calculator simplicity personified well done. I am looking for a E-Liquid Calculator like this for my website, do you know can I get it for wordpress. Hi Paddy, I made this on WordPress, you are welcome to link to it through your site. Any chance of the code or the code to make it a plugin please for personal use on my blog? I would of course link your site as the original author of the calculator.